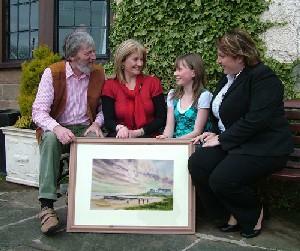 It was only a few months hence, since 12 year old Gillian MacKay�s own painting was a winner. Now the youngster, from Sutherland in the Scottish Highlands, has bagged herself a fellow artist�s original painting, thanks to a Valentine�s gift of raffle tickets from her mother, Karen MacKay.The painting of Brora beach was produced by Paul Taggart from start to finish in front of an audience at the Royal Marine Hotel as part of his fund-raising initiative in support of Highland Hospice. "Imagine my thrill, when the winning ticket drawn from our raffle on behalf of Highland Hospice was held by a youngster who counts art as one of her favourite subjects at school. The live painting demonstration was accompanied by Paul�s running commentary of the techniques used as he created the painting from scratch. In less than two hours the view of Brora beach was completed, inspired by his afternoon walk there on Christmas day last. "The sky that day was absolutely stunning and I decided that the dramatic clouds set against the setting sun were perfect for this event. Little did I imagine that the winner of the finished painting would have produced a Christmas inspired subject of her own!" There will be other opportunities for folk to join Gillian in winning a Paul Taggart original, created in front of their very eyes. Highland Hospice has taken up Paul�s offer to join him in his roadshow around the Highlands and Islands, as an opportunity to not only raise funds. For, as David Welch, Highland Hospice Director of Fund-Raising & Communications, confirms. �Every bit as important as fund-raising, is the opportunity this gives us to meet and greet people, to let them know about the many ways in which hospice works to benefit the community. Details of Paul Taggart�s Highland Hospice Roadshow will be posted on this site and the Highland Hospice site as and when they become available.